The story of TsAfrika is one of passion for quality and a desire to break convention. A simple question was all it took to define the brand how do we re-design the corporate catering model to create an exclusive fine dining experience? TsAfrika came to the market with many unique aspects to its approach: an undiluted focus on food, a model of transparency and responsiveness, and a commitment to break the mould of corporate catering. The immediate impact of the company was evidence that the market was ready for fresh thinking, and TsAfrika grew steadily for the first 5 years of its life to occupy the high-quality niche of the corporate catering market. 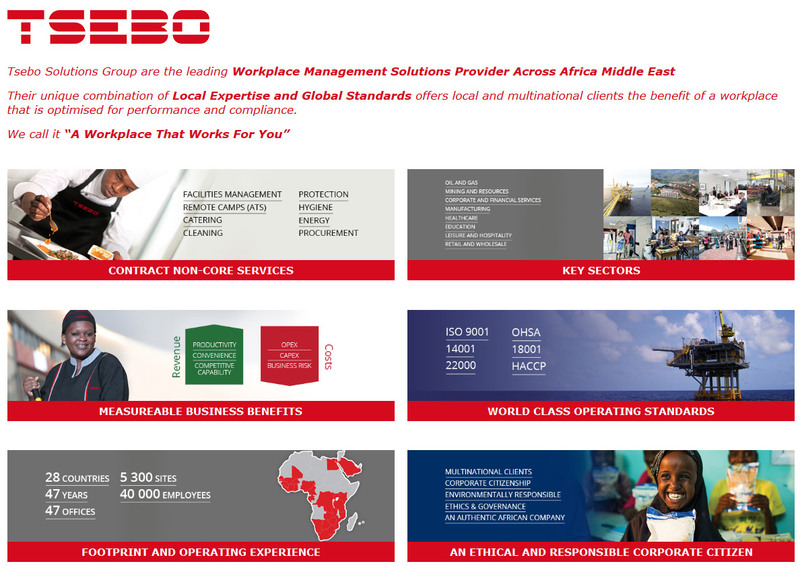 The growth of the business really took off with its acquisition by the Tsebo Solutions Group. Armed with enhanced corporate scale benefits, TsAfrika has grown from being a successful start-up to a marketplace brand with significant equity. TsAfrika has remained completely separate to the Tsebo Group in terms of its business model. It is a completely stand-alone business unit with separate structure, staffing standards and GMPs. Now under the powerful leadership of two industry figureheads with a vast combined experience in high-quality catering, TsAfrika is growing strongly into the future. Innovation: its not a separate function, its part of our core process. Our chefs are creative professionals and need to be challenged constantly to create.